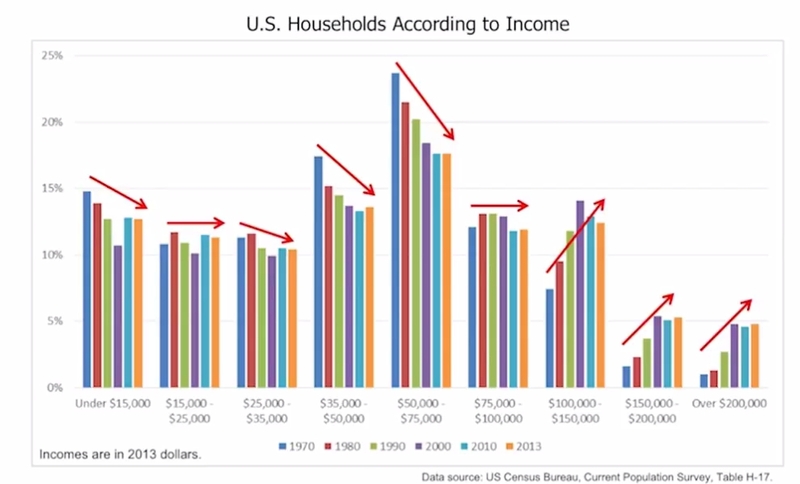 Is the Middle Class Disappearing in America? 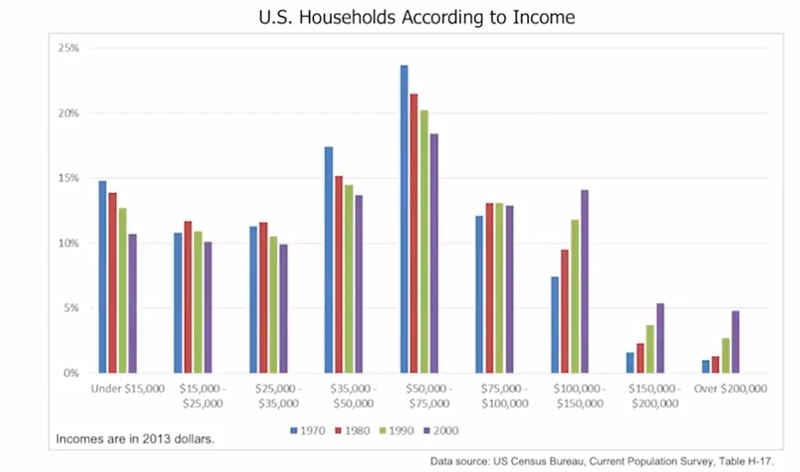 In 1970, about 15% of US households earned today’s equivalent of $15,000 US income or less. 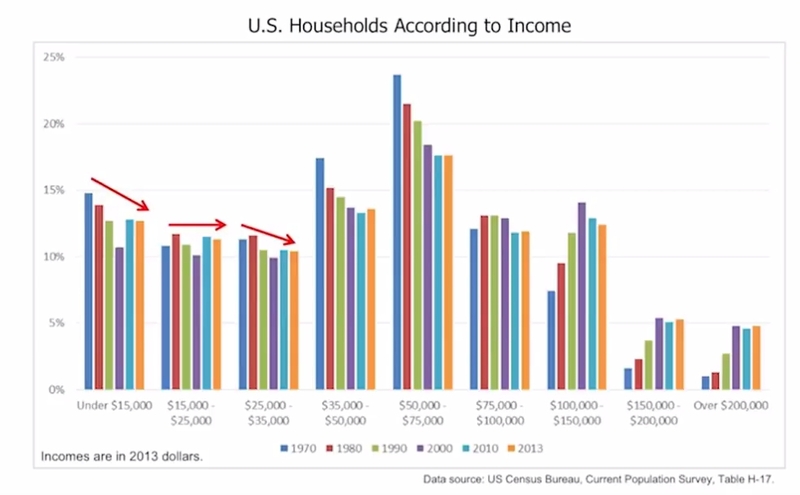 11% earned the equivalent today of $15,00 to $25,000 income, 11% earned $25,000 to $35,000 income, 17% earned $35,000 to $50,000 income. 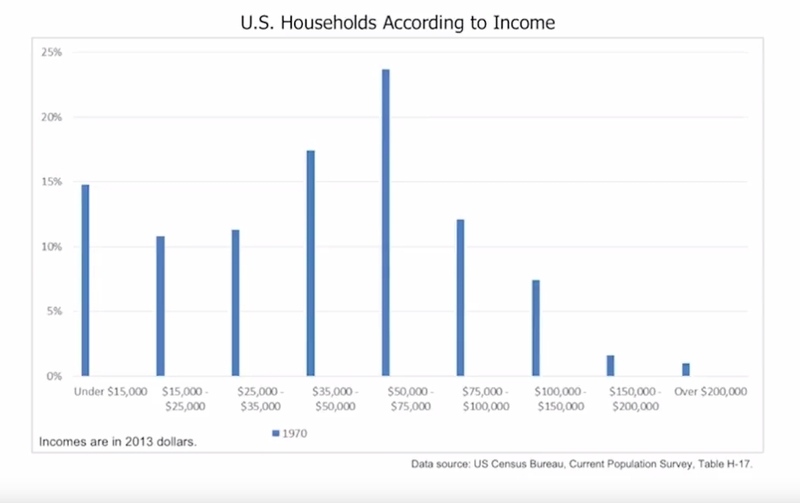 The largest demographic at 24% earned $50,000 to $75.000, 12% earned $75,000 to $100,000, 7% earned $100,000 to $150,000, 2% earned $150,000 to $200,000 and about 1% earned over $200,000. All the figures above are adjusted for inflation. 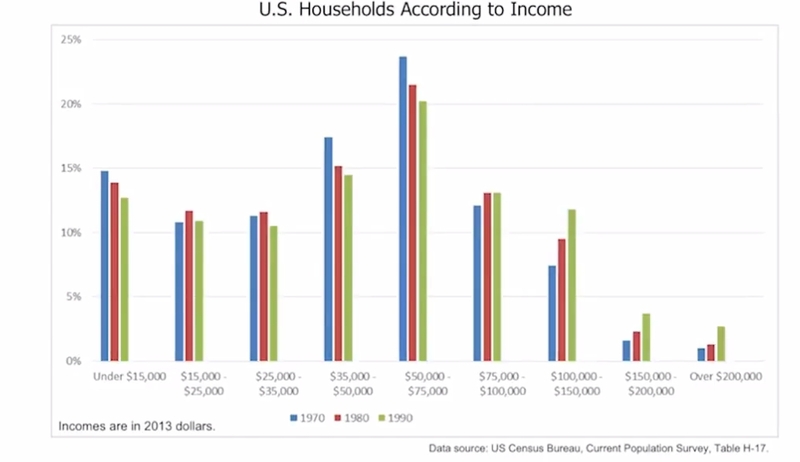 In 1980, we seen slight declines in the under $15,000 group, the $35,000 to $50,000 group and the $50,000 to $75,000 group. The $15,000, to $25,000 group, the $25,000 to $35, 000 group, the $75,000 to $100,000, the $100,000 to $150,000, the $150,000 to $200,000 and the over $200,000 groups all seen slight increases in the percentages of households occupying those demographics. In 1990, we seen decreases in the number of households occupying the first 5 groups. The $75,000 to $100,000 group remained the same and the $100,000 to $150,000 group, the $150,000 to $200,000, and the over $200,000 groups all seen increases in the representation of households occupying those demographics. In 2000, we seen the first 5 groups decline, the 6th remain the same and the last three gain household representation identical to the 1990 data. In 2010, the first three groups seen an increase for the first time in 30 years of household representation, the 4th and 5th groups seen a decrease in household representations, and the 6th, 7th , 8th and 9th groups seen increases in house hold reorientation. In 2013, the first three groups remained the same, the 4th groups increased a little, the 5th and 6th groups remained the same, the 7th group degreased while the 8th and 9th groups increased slightly. 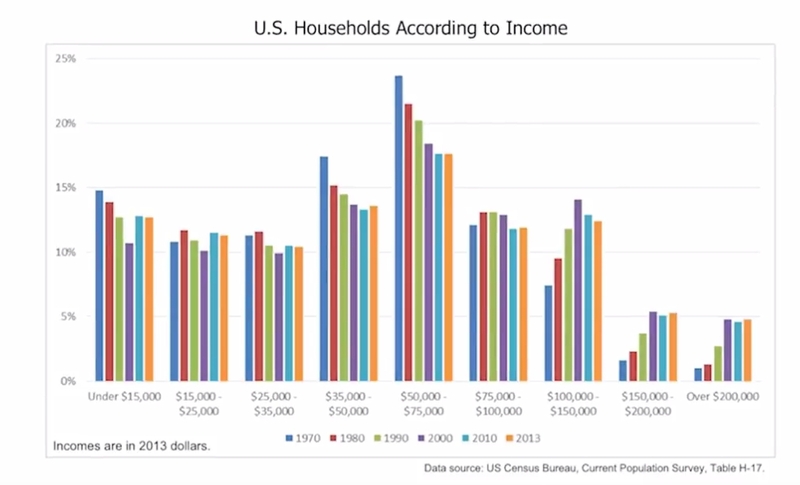 A pattern emerges amongst the poorest or lowest income groups as we see far fewer households occupying those demographics over time than in 1970. 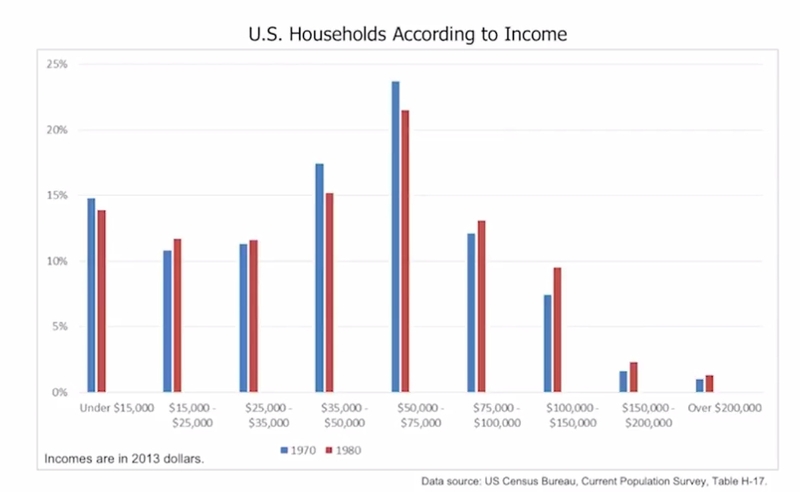 Amongst the middle-income group there are fewer households than in 1970. 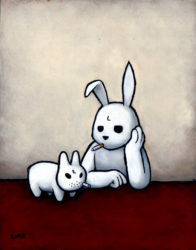 Therefore, the middle class is shrinking and disappearing. However, the poor classes are also shrinking and disappearing. 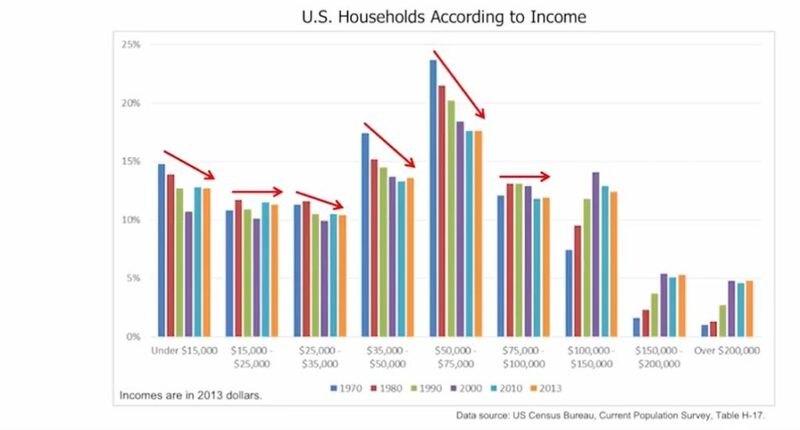 At this point it must be noted that from 1970 to the present the trend is that over time and adjusting for inflation, Americans are leaving the poor income groups, they are leaving the middle-income group and appearing in the rich groups. 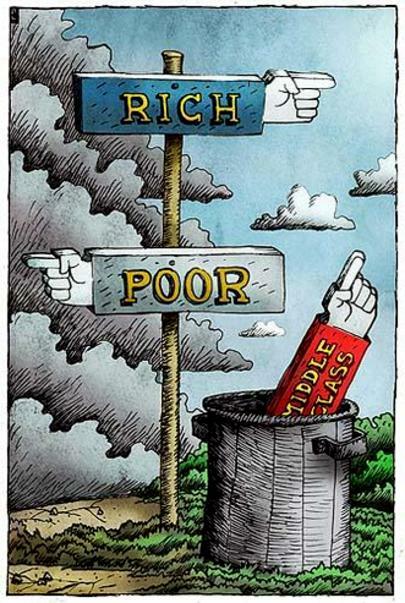 Of course, there are exceptions to this, the truth is that the middle class is disappearing. It is joining the upper classes. Previous PostPrevious Do you Understand what Inequality is? Next PostNext Do you Have Free Speech?